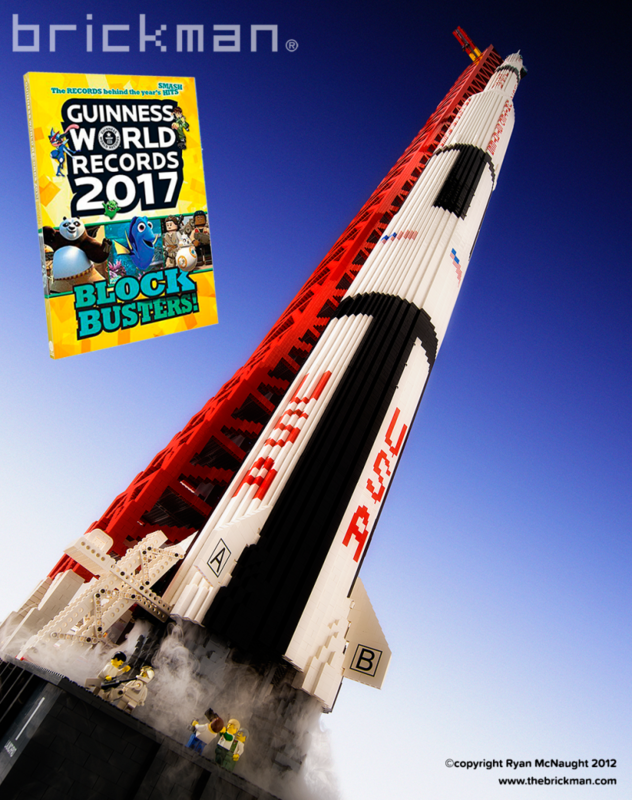 Australia’s tallest LEGO model, Ryan’s massive 6 metre tall Saturn V Rocket and Launch tower, has just been featured in the Guinness Book of World Records- Blockbuster edition for 2017! 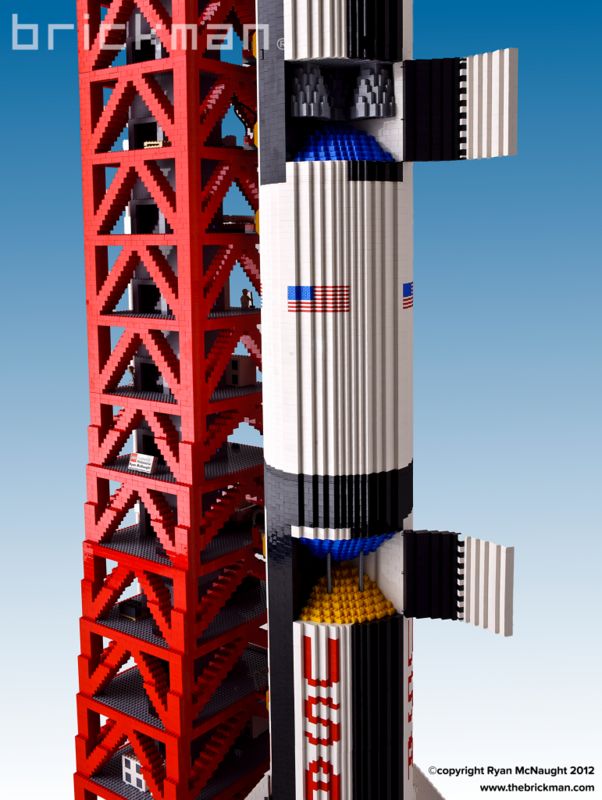 We thought this was a great reason to look back at the Rocket model itself, which was built way back in 2012, and first displayed at Melbourne’s AFOL exhibition, Brickvention at Melbourne Town Hall. The Rocket and Tower each split into 7 sections for transport and must be assembled whenever we install the model with a scissor lift. The Rocket and Tower are then connected at several points by brick-built refueling gantries as well as the walkway to the capsule at the top of the rocket. 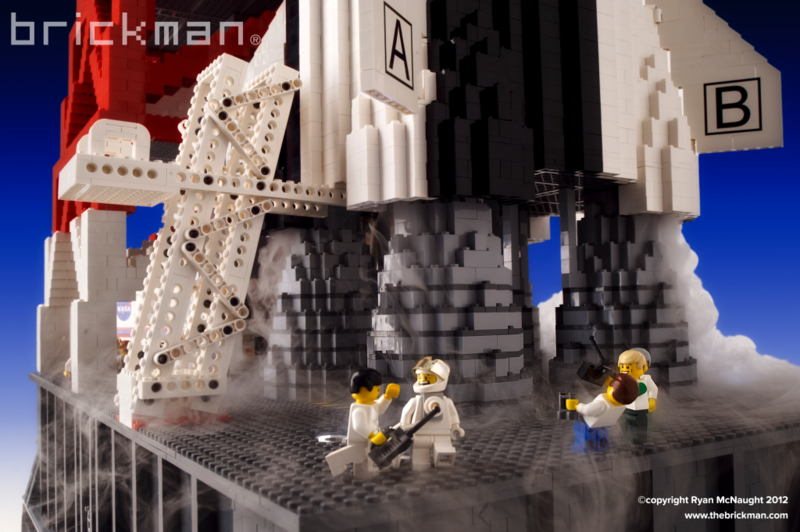 It’s not obvious now as part of the touring Brickman Experience show, but the Rocket itself has several panels that open up on hinges to reveal some of the rockets inner workings. The model also not only has battery powered lights up the entire tower, but also halogen spotlights in the base and channels designed to release dry-ice “smoke”. While running these for a day or 2 is OK, keeping them running for an entire Experience show proved cost prohibitive unfortunately, but you an see them in action in these photos. 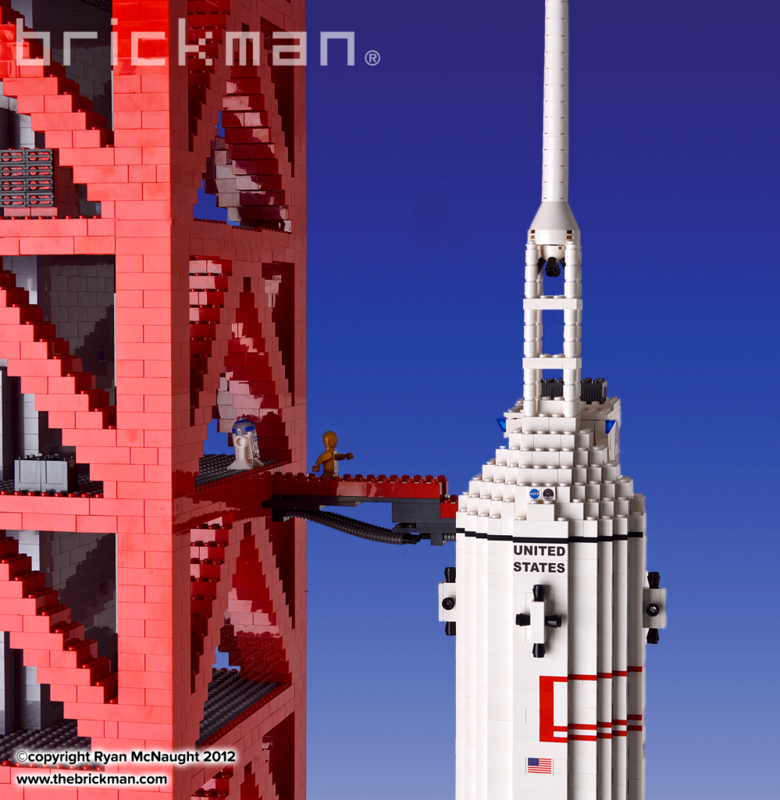 The Rocket is built using a variety of bricks staggered to achieve the cylindrical shape with details built into the walls of the rocket with plates and a few custom printed bricks, such as the stars for the US flag. The Tower is built largely using Ryan’s favourite brick- the 2×4! Altogether it took Ryan over 250 hours and more than 120,000 LEGO bricks to build the Saturn V Rocket- well deserving of a place in the Guinness Book of Records! Check out more photos on Ryan’s Flickr.